Are you a MARVEL fan, or have someone in your family who adores super heroes? 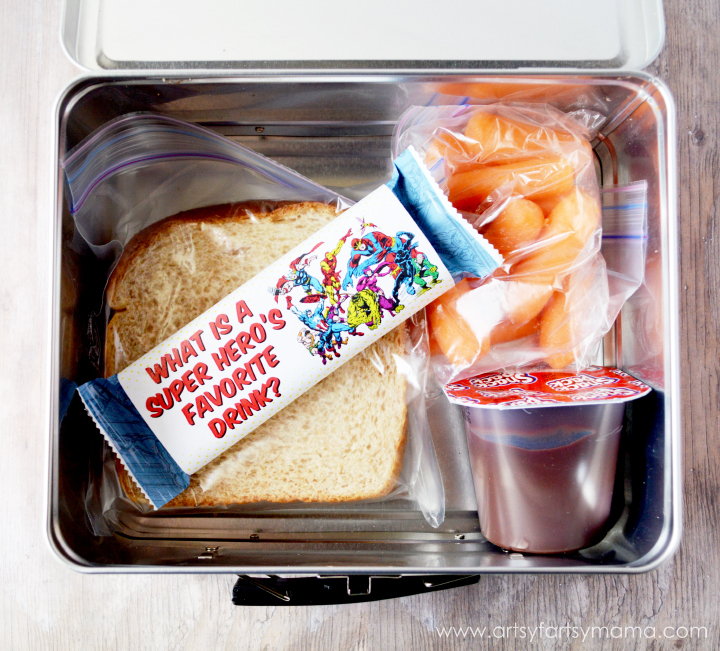 Make their lunch or super hero-themed party MARVEL-lous with some MARVEL Chewy Granola Bars paired with my free printable super hero joke wrappers! 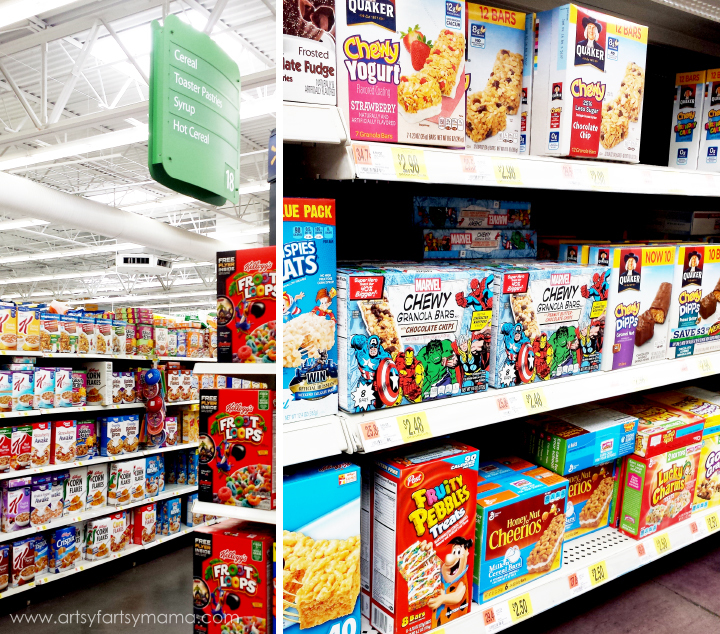 We found the MARVEL Chewy Granola Bars in both chocolate chip and peanut butter chocolate chip in the cereal/granola bar/toaster pastries aisle at Walmart for only $2.48 per box. It's a real BANG for your buck because they’re also 40% bigger when compared to a normal 24g chewy granola bar. The chewy granola bars keep my daughter full and focused throughout the remainder of the school day and make a great after-school snack! Each MARVEL Chewy Granola Bar package includes one of four collector cards: Hulk, Iron Man, Hawk Eye, or Spider Man. So far, we have Thor and Hulk, and are working on finding the other two!! 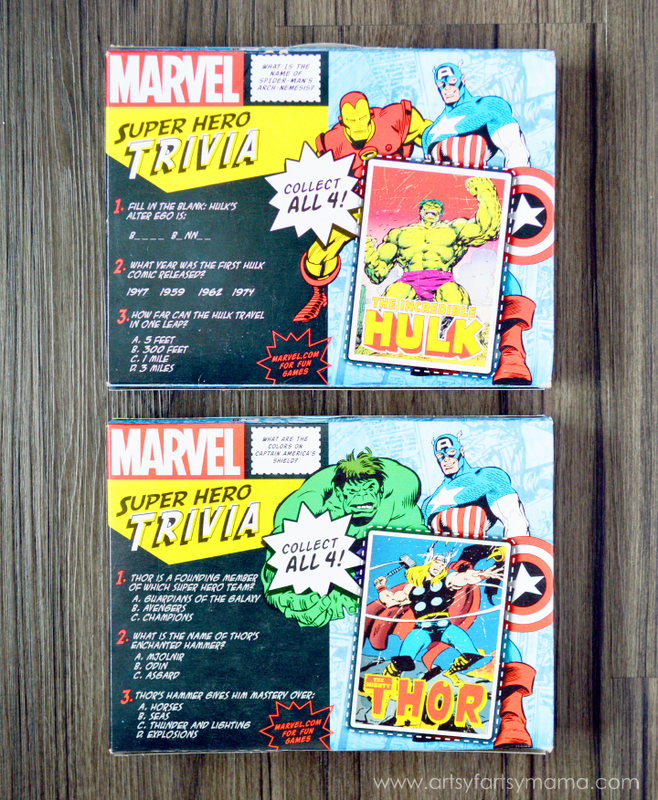 We've also been having a lot of fun with the super hero trivia and learning new facts about each MARVEL super hero. There are 6 different wrappers in each MARVEL Chewy Granola Bar package: Hulk, Spider Man, Black Widow, Thor, Captain America, and Iron Man with fun facts about each super hero. For example, did you know that the Hulk can effectively breathe under water??! I sure didn't!! My daughter has been having so much fun telling everyone she knows different things she's learned about each super hero. 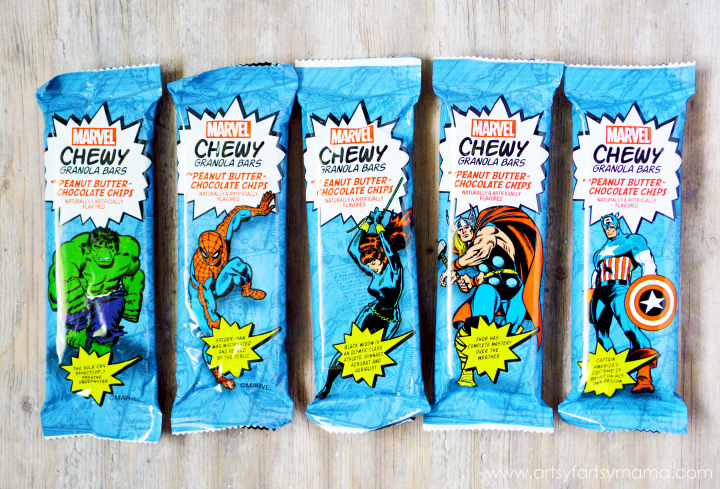 The trivia alone is fun enough for adults and children alike, but I wanted to make the granola bars even more fun at lunch time by designing some wrappers for the MARVEL Chewy Granola Bars with MARVEL super hero jokes! There are 10 joke wrappers total, and each one has a different joke with the answers on the back. Just cut out the designs, wrap them around the granola bars and tape them together. I originally designed the wrappers with my daughter's lunch box in mind. She has been making lots of new friends at school this year, and this is a fun way to make lunchtime really SUPER! Now she and her friends can look forward to jokes and trivia while they eat. 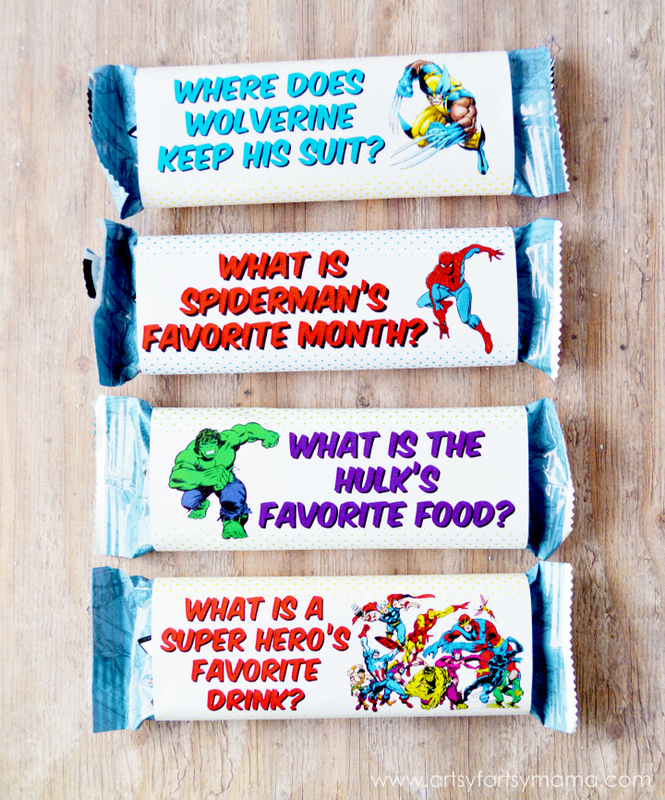 These wrappers would also be fun to use as party favors at your next super hero themed party! 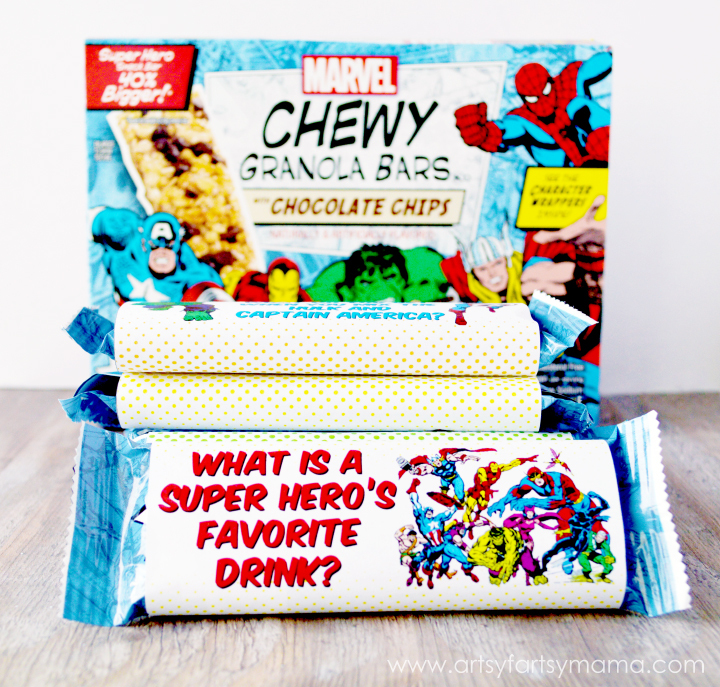 Add the MARVEL Chewy Granola Bars to goodie bags and watch your guests tell each other jokes and share super hero trivia! Be sure to check out the MARVEL Hub for details about the new chewy granola bars. Who is your favorite MARVEL super hero? Leave a comment and let me know! This is awesome! My nephews would be crazy about these. I'll have to get some for him. We have so many students that will love these as well. I'll have to share them with the parents at our center. So fun! I'll have to do this. I want to know the punch lines to the jokes! My whole family is into Marvel! We love the movies and Agents of Shield. Thanks for sharing these cute wrappers! These are so awesome! My youngest would be thrilled to find a super hero joke in her lunchboz!